Are Platinum, Palladium, Rhodium Losing Their Relevance? (Kitco News) - Almost half of all platinum, palladium and rhodium used industrially in the world are consumed in emission control catalysts by the automotive industry. If, as of tomorrow, all conventional engines would cease to exist, the effects on the market for these metals would be earthshaking. A mere theory, or a very real threat? To comply with the United Nation’s commitment to reduce global warming, according to many of the large car producers, the only viable path forward is electrification. Nissan, Tesla and BYD are already selling battery-electric vehicles in large numbers, with other manufacturers close on their heels. Volkswagen Group, in an effort to rise from the ashes of “Dieselgate”, just committed to selling between 2-3 million EVs by 2025; GM has been selling its Volt/Ampera for several years with growing success and just added the Bolt, an affordable compact car with specs to rival the upcoming Tesla Model 3. 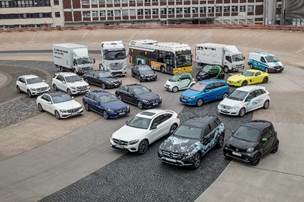 Daimler Benz just informed the public that their entire product lineup will be available in electric versions from 2020 on. In the passenger car market, all other car manufacturers will doubtlessly come on board to maintain their positions in the market. The enthusiasm, of course, is being forced upon the industry at a growing pace. Norway led the way after passing a law making the sale of petrol engine cars illegal starting from 2020. Other countries including Germany (2025), The Netherlands (2025) and India (2030) are about to follow suit. California, a key market for alternative energy products and one of the world’s leading economic “nations” by itself, will surely do the same. In other words: anyone not on board with alternative fuels is likely to have a “Kodak” experience by around 2025. In a recent publication, Bloomberg pointed out a different angle of these events, emphasizing how close to the tipping point we already are. Reflecting on the collapse of oil markets in 2015, the authors state that it took a reduction of 2 million barrels of oil per day to cause an oil crisis. 2 million barrels is the approximate amount of oil saved by 5 million electric vehicles. Considering aspects like the 400,000+ preorders for Tesla’s Model 3 and the budgets of other car makers, their projection is that this number will be reached by 2020. As a result, oil markets will be facing a major crisis by 2023 at the latest, at which point even more producers will go out of business, and the market will permanently shift. For decades, the precious metals industry’s hopes rested on the fuel cell electric vehicle (FCEV). According to information from Toyota, their current generation Mirai FCEV requires approximately 30g of platinum; the goal is to eventually reduce this loading to about 6-8g by 2020 which would put it almost on par with the amount of metal used by an emission control catalyst today. Hydrogen cars are electric cars, only their fuel source differs from battery-electric vehicles which are generally heavier, and take longer to refuel. In fact, several car companies including Mercedes Benz, Toyota and Honda are pursuing both paths. While charging technology for BEVs is making progress, congestion and other annoyances at public chargers are growing. Also, power grids in many parts of the world are not ready for the volume of cars. The FCEV, to be refueled at a gas station much like a gasoline car in less than 3 minutes, does not have that problem – in theory. The fact is that there is virtually no usable infrastructure as of yet, nor are the cars as readily available to the public as BEVs. What is worse, while battery-electric vehicles soar on the iconic popularity of Elon Musk, hydrogen is struggling to do the same. Instead, concerns – rational and irrational – about the price and availability of hydrogen, the safety of the vehicles and even accusations of being the next “big oil” remain unanswered as the industry hasn’t found a way to communicate as effectively with the pioneers and mavens of alternative mobility. Hydrogen still needs 3-5 years to make a serious market entrance but if the communication issue isn’t fixed, its proponents may experience a “Betamax” moment. Whichever way consumers and industries will move, the automotive catalyst appears to be past the peak of its life cycle and seems destined to face a decline within a decade. 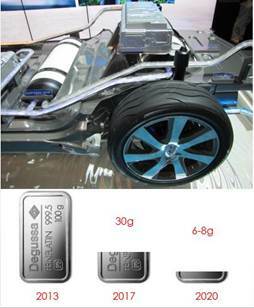 During this period, catalysts are likely to get smaller in size with shrinking engine sizes, and they will become more complex in coating technology due to increasingly stringent regulations everywhere in the world. Finding new markets for platinum, palladium and rhodium will be a key challenge to precious metal producers and fabricators to prevent a drop in demand for these metals. Otherwise, a look down a cliff is a very real possibility.